Osprey numbers have increased, but their next threat may be the depletion of menhaden, now under intense fishing pressure because of the boom in the fish-oil market. This story was originally published in the Spring 2017 issue of Living Bird magazine, the official membership publication of the Cornell Lab of Ornithology. In late spring, he paddles his canoe into the Great Island saltmarsh, 500 acres of prime osprey habitat where the Connecticut River flows into Long Island Sound. In this marshy inlet, Spitzer checks for action in nests among 35o osprey platforms that have been erected here since the late 1950s. As he disembarks, the resident ospreys take to anxious flight. 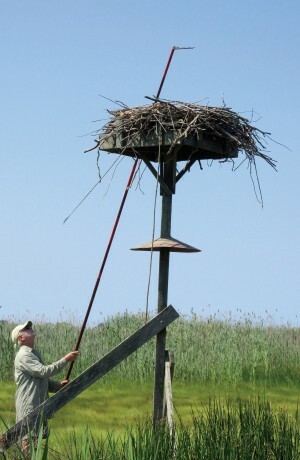 He raises a pole topped with a mirror over a platform nest. 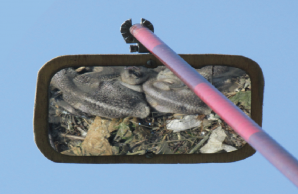 These days, he sees abundant breeding success in the mirror’s reflection—three healthy young birds with ragged crests and brown-spangled wings. But it wasn’t always this way. 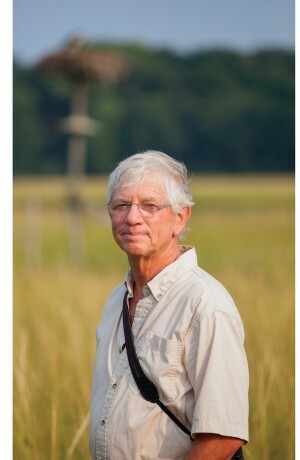 Ecologist Paul Spitzer has been watching the ospreys in the Connecticut River estuary for almost 60 years. Behind him is an osprey platform. Spitzer first stepped onto Great Island nearly 60 years ago, as an 11-year-old boy in 1957. That year, he accompanied birding legend Roger Tory Peterson on a Christmas Bird Count. Thus began a mentorship that set Spitzer onto a career path to becoming an ecologist. From the 1960s through the 1970s, Spitzer watched ospreys almost disappear from Connecticut, and he pioneered experiments that helped establish DDT as a cause of their decline. 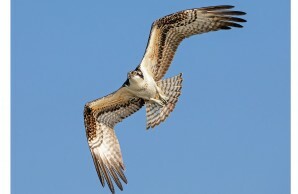 He has also seen ospreys make a triumphant recovery in the Connecticut River estuary. And with more than 300 active nests recorded in the state today, he is now turning his attention below the water, where the next challenge for osprey is a vanishing fish. Peterson tracked the decline of local ospreys from 150 in the 1950s to just 13 in 1965. He and his wife Barbara tried to help the ospreys by building dozens of nest platforms to protect their nests from predators such as raccoons. But the birds still weren’t bringing forth fledglings. Food didn’t seem to be a problem—there was no shortage of menhaden (Brevoortia tyrannus), the large-headed bait fish that is one of the osprey’s primary food sources in Long Island Sound. Spitzer had spent hours watching the fish hawks rising from the water with menhaden nearly a foot long in their oversized talons. Spitzer uses a mirror attached to a telescopic pole to check on osprey nests. During nest checks, Spitzer found thin-shelled, collapsing eggs and was reminded of a British study that showed similar thinning in peregrine falcon (Falco peregrinus) eggs. Shortly after receiving his biology degree from Wesleyan University, Spitzer had the idea to isolate local ecological effects in Connecticut by switching eggs in osprey nests there with eggs from a healthy population of breeding osprey near Chesapeake Bay. “Not nearly as much DDT was applied to Maryland saltmarshes, and it was probably diluted in the far larger Chesapeake system,” says Spitzer. By performing the switch, he could isolate whether the problem was with local environmental conditions or intrinsic to the Connecticut eggs. The Patuxent Wildlife Research Center in Maryland signed on to Spitzer’s idea and provided staff to collect eggs. From the outset, Spitzer saw the Maryland eggs hatch healthy chicks in Connecticut, but not vice versa. 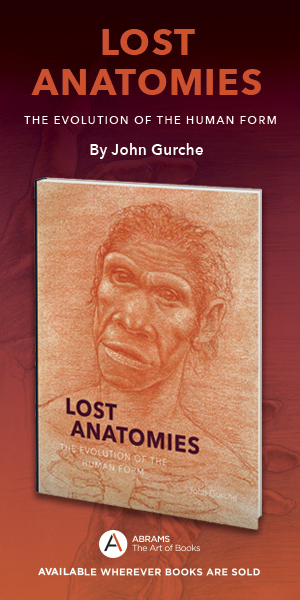 “The embryos in Connecticut eggs died, and we found the shells to be thin by simple measurement,” he says. 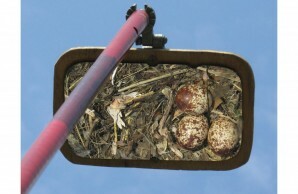 “We also found dented or collapsed eggs in some Connecticut nests.” None of these problems affected the Maryland eggs. Next, he arranged transfers of young nestlings from Maryland to Connecticut, to look beyond egg problems. The results were the same: “Virtually all the Maryland nestlings fledged in Connecticut, [so there were] no problems with food at this time. The failure was egg viability,” Spitzer says. Later lab tests revealed DDE (a breakdown product of DDT) as well as PCBs and another organochloride, dieldrin, at much higher concentrations in the Connecticut eggs compared to the Maryland eggs. “All signs pointed to Roger’s hunch being right, that it was DDT,” Spitzer says. Back in the 1960s, he would often see collapsed eggs in the mirror’s reflection. Today he typically sees healthy eggs (right) or nestlings (left). DDT was banned in Connecticut in 1972, and two years later osprey numbers on Great Island bottomed out, with just a single nest remaining as the vestiges of DDT made their way out of the ecosystem. Today, there are approximately 100 active nests at Great Island and the overflow is helping populations at nearby Gardiners Island and eastern Long Island grow. Statewide, the Connecticut Audubon Society’s Osprey Nation monitoring project recorded 337 active nests in 2016, and 490 fledged young throughout the state—a rate nearly double that which Spitzer had calculated was necessary for a stable osprey population. Numbers like these, along with steady positive trends along Breeding Bird Survey routes, help explain why breeding ospreys are now abundant and widespread in Connecticut and throughout the eastern United States. 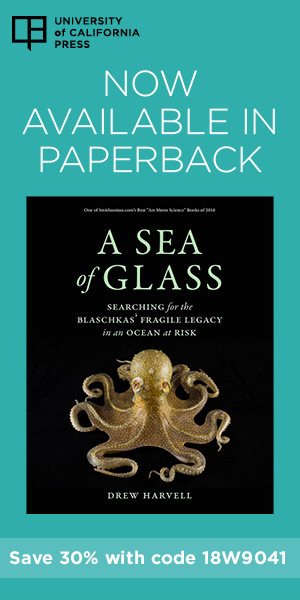 Spitzer points to a combination of factors, including an increase in artificial nest sites, a decrease in harmful residues in their food sources, and continued high levels of food availability, particularly Atlantic menhaden. 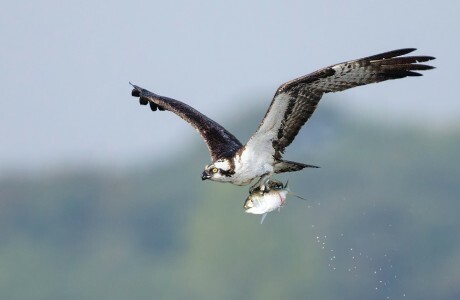 For the last three summers the Connecticut Audubon Society has sponsored Spitzer’s ongoing work in the Connecticut River estuary, but the aim of the research has now shifted to monitoring the relationship between osprey and menhaden. As in the 1960s, Spitzer’s attention is again focused on Great Island, now fittingly protected as a Roger Tory Peterson Wildlife Area. During June and July, Spitzer has documented that the ospreys’ diet is 95 percent to 100 percent menhaden. Spitzer says the story is much the same from Connecticut to Virginia, with menhaden-fueled osprey nesting colonies experiencing a revival. Osprey with menhaden, an important food source. Most of the nearly 200,000-metric-ton annual menhaden catch is rendered into omega-3 fatty acid fish oil for the health supplement industry. And most of that catch comes via purse-seine fishing, in which two fishing boats circle around a single school of fish and enclose it within a gigantic net. These operations are extremely efficient at catching huge volumes of fish. Only one state (Virginia) currently allows purse-seine fishing of menhaden, but the fish caught in the Chesapeake Bay and Virginia waters account for 85 percent of the total menhaden harvest. Because a large share of the range-wide menhaden population is clustered in the mid- Atlantic region, harvests there have a significant effect on the population as a whole. As the fish-oil market boomed in the 1990s and 2000s, menhaden populations began to dwindle. In 2010 stocks hit a 54-year low. In 2013 the Atlantic States Marine Fisheries Commission (ASMFC) reduced the quota of commercial menhaden harvest by 20 percent. Spitzer attributes the recent robust East Coast osprey populations to the renewed health of the menhaden fishery following these new rules. But now, many ocean conservationists say menhaden are once again coming under intense fishing pressure. In 2015 and 2016, the quota was increased by about 10 percent, and the menhaden quota for 2017 has been increased by about 6 percent from 2016. Some industry representatives are suggesting that the menhaden quota could be raised by up to 30 percent without harming the overall fishery.